​The ​Utah Jazz may be the NBA's new definition of petty. In a 30-point blowout victory against the ​Phoenix Suns, the Jazz ensured there was no positive spin Phoenix fans could take home with them. 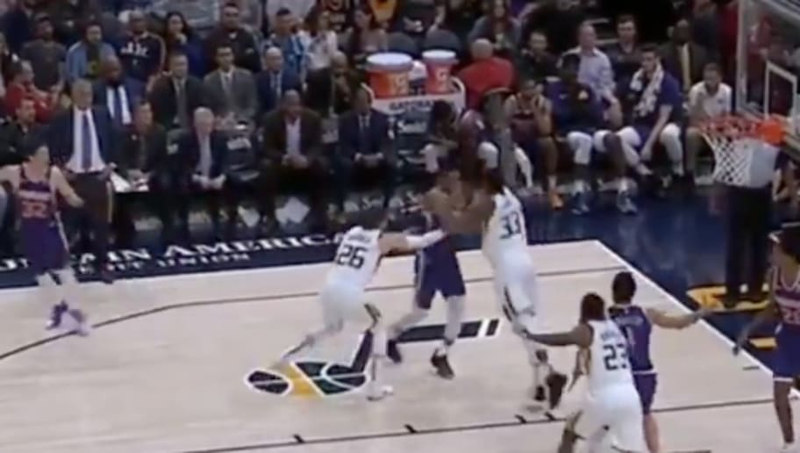 At the end of the game, rather than let the Suns run a play for ​Devin Booker, who was sitting on 59 points, Utah opted to intentionally foul De'Anthony Melton. ​​Up 33 at the time of the foul, the Jazz still deemed it necessary to extend the game by fouling Melton and sending him to the charity stripe, rather than allowing Booker to take a final shot and eclipse the 60-point threshold for the second time in his career. Booker was sensational during the game, lighting up the Jazz for 59 points on an efficient 19-for-34 shooting, including 5-for-8 from three and 16-for-17 from the free-throw line. It wasn't enough to propel the Suns to victory, or even the century mark as the team finished the game with 92 points and Booker was the only player to score in double figures. Devin Booker scored 59 points (19/34 FG) tonight. Booker seems to come alive in late-March when his team is well out of the postseason picture. His 59-point performance comes ​one year and one day after his incredible 70-point outing in 2018. While Booker went off on Monday night against the Jazz, Utah will get the last laugh as they prevented him from reaching the 60-point milestone, while also handing Phoenix a 33-point loss.